On arrival at the airport you will be received by our representative and transfer to hotel. After quick freshen up drive to Kichu Lhakhang, among the 108 temples built in a single day in 649 AD/ Drugyel Dzong built in 1646 to commemorate victory over Tibetan invaders, led by Mongolian warlord Gushri khan --- Ta Dzong, the National Museum of the Kingdom. Originally built as Watch Tower, since 1967 it is acting as the National museum which displays ancient paintings, stamp collection, and artifacts of Bhutan. Paro Rinpung Dzong built in 1646 by Zhabdrung, which now houses monks and administrative office of Paro.Overnight at Paro. After early breakfast drive Thimphu the capital city for sightseeing. Visit Takin zoo --- school of 13 arts and crafts of Bhutan ---- handmade paper factory --- National Library which has vast collection of ancient Buddhist texts and manuscripts --- Folk Heritage Museum, showcasing the Bhutanese living during the 17th century/Simtokha Dzong the 1st Dzong built by Zhabdrung in 1626 --- Memorial Chorten, the Stupa built in the memory of Bhutan's Third King who is also known as the Father of modern Bhutan --- if time permits visit some other olden temples around Thimphu In evening after governments office hour visit Tashichho Dzong, the beautiful medieval fortress housing Government's office and King's Throne room it is also the summer residence of Je Khenpo, the Chief Abbot. Overnight in Thimphu. After breakfast drive uphill to Trongsa passing through Wangdue town until you reach Pelela (pass) (3200m) which divides the east and west Bhutan. From there you drive downhill and stop at Chendipjee to see the Chendipjee Chorten, built in around 19th century by lama Sidha. The Stupa is styled similar to Swayambhunath Stupa in Katmandu, Nepal. It takes another hour until you reach Trongsa. / visit Ta Dzong the watch tower of Trongsa Dzong. Overnight at Trongsa. The journey continues eastwards, winding through more rugged terrain. The drive to Mongar takes about 6 hours, with spectacular views en route. We will drive up into the hills above the valley and then past Ura village, before climbing sharply to the highest point on Bhutan’s motor able road network, Thrumsing-la pass (4,000m/13,125ft). From here, the road gradually descends to the alpine valley of Sengor, with wonderful views of cascading waterfalls and the hills of eastern Bhutan along the way. Vegetation changes from alpine to subtropical with the loss of height, and bamboos and luxuriant ferns overhang the road as we drop down to the valley floor. The descent stops at 700m/2,300ft, where we cross the Kuri Chu (river). We ascend again through pine forests, maize fields and eastern hamlets to reach Mongar town, high on a gentle slope above the valley. Picnic lunch at a scenic spot en route to Mongar. We visit Mongar Dzong, built in the 1930s and one of Bhutan’s newest dzongs, but constructed in the same way as all previous Dzongs, without either plans or the use of nails. Overnight at the lodge in Mongar. This trip of about 96 km. takes only 3 hours. The first part of journey is through leafy forest filled with ferns. After driving through the Kori-la pass (2,450m/8,040ft), marked by a pretty Chorten and a Mani wall, we descend rapidly through corn fields and banana groves to reach the famous road zigzags just below Yadi, a fairly recent and now fast-growing settlement. After zigzagging down the hillside, the road east runs along the Gamri River. A turnoff on the left leads up to Drametse. The temple, perched on top of a steep hill above the village, was founded by Choeden Zangmo and is the most important monastery of eastern Bhutan. This is the place of origin of the famous Drametse Nga Chham, a masked dance with drums. About 30 km. onwards lies Trashigang (1,100m/3,610ft), which clings to a steep hillside above the Gamri river. 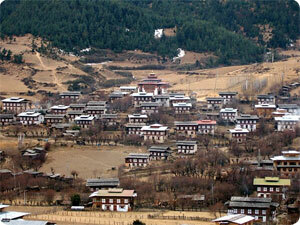 Trashigang is the principal township of the biggest and most populated district in the country. After lunch, we will visit Trashigang Dzong, standing at the extreme end of a rocky outcrop far above the river gorge. It serves as the administrative seat for the district and part of the Dzong is occupied by the local monastic community. Overnight at the lodge in Trashigang. The Trashigang – Samdrupjongkhar road was completed in 1965, and the journey down it to the Indian border takes about 6 hours. Along the way, we pass by Sherubtse College in Kanglung, which was founded in 1978 and is a degree-granting institution affiliated to the University of Delhi. We also visit the nearby Zangtho Pelri temple representing Guru Rinpoche’s paradise, built in 1978 by the late Minister of Home Affairs. We then drive on to Khaling, home of the National Institute for the Disabled and the Weaving Centre. Visits to these may be arranged by prior request only, before leaving Thimphu. From here, it is a further 80 km. to Deothang, which is remembered in history as the site of a famous 19th century battle fought during the Duar Wars, in which the forces of Jigme Namgyel defeated the British. The road then descends fairly rapidly to the plains through dense tropical forest with an abundance of teak, bamboo and ferns. Overnight at the lodge in Samdrupjongkhar. After breakfast, drive to Gauwahati, the capital town of the Indian north-eastern state of Assam, for flight to Delhi/Kolkata or onward program in that region.